Today on Veterans Day we honor all Americans who have served in the armed forces. Technical Sergeant Leonard P. Matlovich was a Vietnam War veteran, race relations instructor, and recipient of the Purple Heart and the Bronze Star. 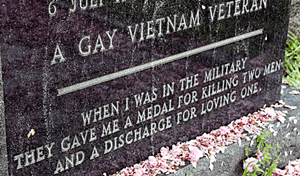 He was also the first gay service member to fight the ban of gays in the military. His fight to stay in the United States Air Force after coming out of the closet resulted in articles in newspapers and magazines throughout the country, numerous television interviews, and a television movie on NBC. His photograph appeared on the cover of the September 8, 1975, issue of Time magazine, making him a symbol for thousands of gay and lesbian service members and the gay community. In March 1974, previously unaware of the organized gay movement, Matlovich read an interview in the Air Force Times with gay activist Frank Kameny who had counseled several gays in the military over the years. He called Kameny in Washington, D.C. and learned that Kameny had long been looking for a gay service member with a perfect record to create a test case to challenge the military’s ban on gays. Four months later, he met with Kameny at the longtime activist’s Washington, D.C. home. After several months of discussion with Kameny and ACLU attorney David Addlestone during which they formulated a plan, he hand-delivered a letter to his Langley AFB commanding officer on March 6, 1975. When his commander asked, “What does this mean?” Matlovich replied, “It means Brown versus the Board of Education” – a reference to the 1954 landmark Supreme Court case outlawing racial segregation in public schools. During his September 1975 administrative discharge hearing, an Air Force attorney asked him if he would sign a document pledging to “never practice homosexuality again” in exchange for being allowed to remain in the Air Force. Matlovich refused. Despite his exemplary military record, tours of duty in Vietnam, and high performance evaluations, the panel ruled Matlovich unfit for service and he was recommended for a General, or Less than Honorable, discharge. The base commander, Alton J. Thogersen, citing his service record, recommended that it be upgraded to Honorable. The Secretary of the Air Force agreed, confirming Matlovich’s discharge in October 1975. He sued for reinstatement, but the legal process was a long one, with the case moving back and forth between United States District and Circuit Courts. When, by September 1980, the Air Force had failed to provide US District Court Judge Gerhard Gesell an explanation of why Matlovich did not meet their criteria for exception (which by then had been eliminated but still could have applied to him), Gesell ordered him reinstated into the Air Force and promoted. The Air Force offered Matlovich a financial settlement instead, and convinced they would find some other reason to discharge him if he reentered the service, or the conservative US Supreme Court would rule against him should the Air Force appeal, Matlovich accepted. The figure, based on back pay, future pay, and pension was $160,000. Below is the first television interview with Sgt. Leonard Matlovich from 1975. Thank you for remembering my late friend Leoanard on this historic day. For videos of other interviews with him, as well as his remarks at the dedication of a project he conceived of but never lived to see completed—a memorial to Harvey Milk in Washington DC—and his final speech, please see: http://www.leonardmatlovich.com. Leonard’s grave is in Congressional Cemetery in SE Washington DC. Guess who his nearest neighboring grave site is…..J. Edgar Hoover.